128 Ft. Obstacle Course – Are you up to the challenge of the longest inflatable obstacle course available at About to Bounce? Are you ready to traverse the perils that stand before you; duck, dive, climb, and bounce your way to victory on the other side? 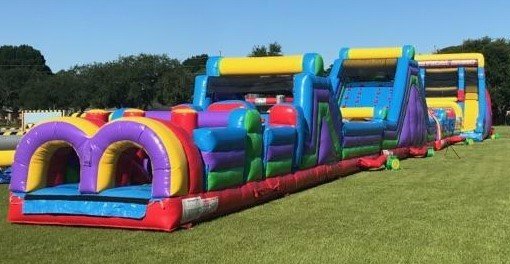 If you have the fire in your heart, and you are up for a wild adventure, the About to Bounce 128 Foot Obstacle Course is the inflatable rental for you in the New Orleans area. With a 17 foot rock climbing wall, a 20 foot vertical height, and 128 feet nonstop action, the About to Bounce 128 Foot Obstacle Course will test all the skills of every guest at your birthday party, special event or corporate gathering. Race against your peers to see who will be victorious. Priced at $999 for a five hour rental, this is one world-class inflatable obstacle course that will blow away your guests and take your event to the next level.